One evening, Donkey Kong didn't return from his usual lazing around at the beach. Diddy and his girlfriend Dixie went to find him but instead found dozens of claw prints and a ransom note from "Kaptain K. Rool". 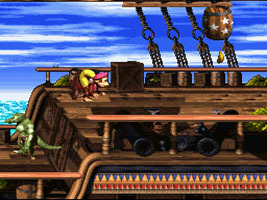 The pair follow the trail to K. Rool's pirate ship, bound for Crocodile Isle, home of the Kremlings. Diddy has not changed much since the first game, while Dixie has the ability to glide by spinning her ponytail. When you have both Kongs they can pick each other up and throw each other. The Kong Family (including newcomers Wrinkly and Swanky Kong) must now be paid with Banana Coins, found throughout the game. There are also new animal buddies, items and abilities. 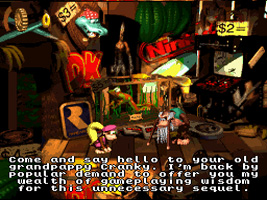 Cranky Kong's cabin has a number of references to Rare's fighting game, Killer Instinct. There is a Killer Instinct arcade machine and a poster of Thunder, one of the fighters in the game. On the map screen for Krazy Kremland, Cranky's Cabin appears as a fairground tent. There is a sign above it that reads "KI Here" and another Killer Instinct arcade machine outside. 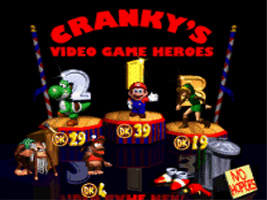 When you complete the game, the number of DK Coins you have collected determines your position on the pedestal of "Cranky's Video Game Heroes". Unless you have collected enough DK Coins, first place is Mario (from the Mario series), second place is Yoshi (also from the Mario series), and third place is Link (from The Legend of Zelda series). There is also a trash can signposted "No Hopers", which has Sonic the Hedgehog's shoes, and Earthworm Jim's gun next to it. "The Plus Barrels will add time to the timer, the Minus Barrel will send you into the Minus World! (Uhhh... wrong game. Actually they will take seconds away from the timer.)" This refers to the Minus World, an infamous glitch in Super Mario Bros. In the Animal Antics stage, the Rare logo appears made out of Bananas.